Apart from Jolly Cow Fresh Milk’s creaminess and full-bodied texture, the best part about it is its free-range quality. Besides being a fresh milk, also a full cream, its treasure trove of calcium, vitamins, and minerals has made it more special with its intrinsic flavor that comes from the finest breed of free-range cattle of Europe, which means Cows are allowed to graze freely and feed on natural grass instead of processed feeds in a clean and cozy environment with drinking water fit for humans. In addition, the cooperative farmers know their cows by name and ensure they only undergo a milking process that doesn’t make them feel uncomfortable to guarantee that all Jolly Cow milks will only come from “happy cows”. Since these cows are grown and milked in the Northern side of the world, where wider and well-heeled grasslands are in abundance, consumers are assured that the cows are naturally fed. This ensures that customers will enjoy a tastier, healthier, and creamylicious milk in every Jolly Cow pack. To maintain Jolly Cow Fresh Milk’s freshness and nutritional value, the extracted milk undergoes ultra-high temperature (UHT) process, which passed high quality control standards of Europe, ensuring all consumers get a high quality product. The unique UHT process, which wards off any possible harmful microorganism prior to wrapping and shipping also, extends shell life so the taste and quality remains consistent. Because “happy cows are healthy cows’, all packs of Jolly Cow Fresh Milk offers the best value for-money with top notch taste and health benefits. So if you’re looking for an affordable and creamylicious calcium source, you won’t find anything resembling to Jolly Cow Fresh Milk— pure, fresh, natural and definitely comes from happy cows. To learn more about Fly Ace, visit www.flyacecorp.com. 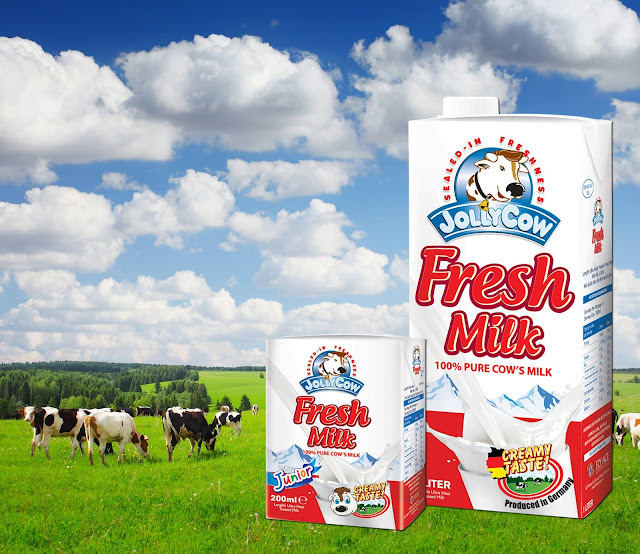 Jolly Cow Fresh Milk 1 liter and 200 ml size is available in leading supermarkets, and groceries nationwide. For more updates, visit and like its official Facebook fan page: www.facebook.com/JollyCowPH/.